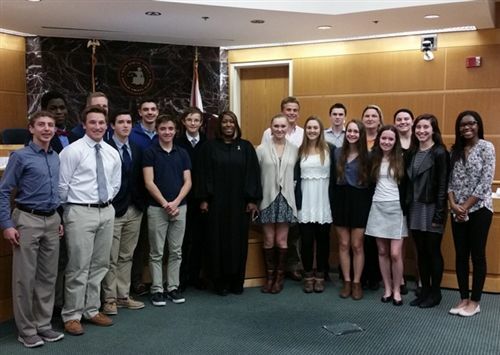 On February 8, 2016, Shorecrest Upper School's Guardian ad Litem Service Club went to Dependency Court with Judge Moore and listened in on some cases. The cases that the students sat in on were Juvenile Criminal Cases and Shelter Cases. In the criminal cases, the students were able to see two cases. One involved a fifteen year old male who was being held for possession of a firearm on more than one account and grand theft auto. The other case, was a case that involved another fifteen year old male who was being held for abuse and battery charges against his own mother. After the criminal cases were over, the students got to sit in and listen to the Shelter Cases. These cases ranged from cases where they had to find a safe place for a child, to cases where they were just following up on some other previous hearings. In all of the cases, every child had an appointed Guardian at Litem. In two of the Shelter Cases, the child had to be moved from state to state, and in lots of the other cases many of the parental rights were terminated. When Judge Moore completed her cases, the students got to ask her questions and even had time for a little photo opp at the end. The students learned a lot about the court system, what happens to some children in court, and why the Guardian ad Litem gets involved - because there are a lot of kids who need a voice... and their Guardian is that voice!